1880s/1890s autograph album that belonged, presumably, to Elizabeth Frances Burnham of Dunbarton, New Hampshire, with ties to Middleton, Massachusetts, and to the Y. W. C. A. at Boston, Massachusetts. There's no ownership page, but one page is inscribed by Lizzie H. Burnham at Dunbarton, New Hampshire, on January 16, 1886, who described herself as "Your mother". Lizzie and her husband Abram or Abraham Burnham had, I think, four children, but , sadly, only one, Elizabeth Frances Burnham, survived to the years that this album covers. 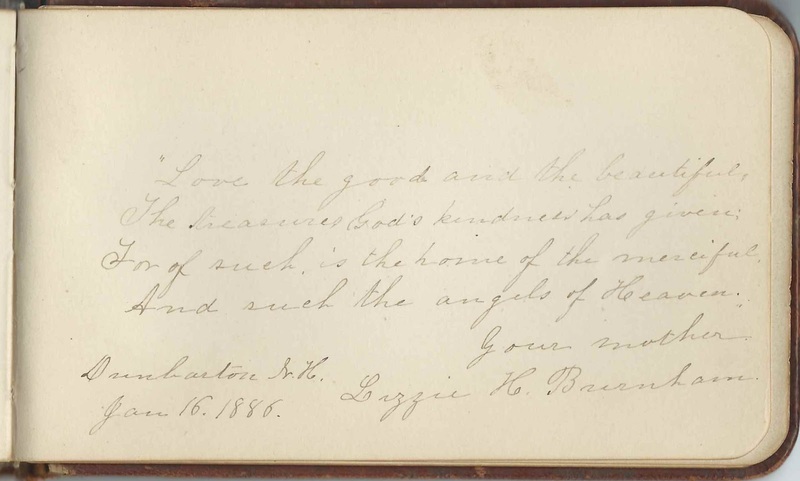 The album measures approximately 6-1/4" by 3-3/4" and contains the sentiments of over fifty of Elizabeth Frances Burnham's relatives and friends. Many of these friends gave the Boston, Massachusetts, Young Women's Christian Association as their address; presumably, Elizabeth Frances herself lived there in 1887 while working or studying at Boston. Elizabeth Frances Burnham, "Lizzie", was born May 24, 1867 at Hooksett, New Hampshire, daughter of Abraham Burnham and Elizabeth H. (Phelps) Burnham, who were born at Dunbarton, New Hampshire, and Fairfield, Maine, respectively. On December 21, 1890 at Dunbarton, New Hampshire, Lizzie married Alfred Hamilton Marshall, son of William H. Marshall and Elizabeth T. (Hamilton) Marshall. Alfred was born January 19, 1870. Alfred, of East Weare, New Hampshire, inscribed a page in Lizzie's album on March 10, 1889. Alfred and Lizzie had three daughters. Lizzie died in 1927 and Alfred in 1961. They buried in the East Weare Cemetery at Weare, New Hampshire: Lizzie and Alfred. Emma L. Flint, "your cousin"; inscribed at Middleton, presumably Massachusetts, on September 26, 1888. Daughter of Caroline Archer (Phelps) Flint, sister of Elizabeth H. (Phelps) Burnham, mother of album owner Elizabeth Frances Burnham. 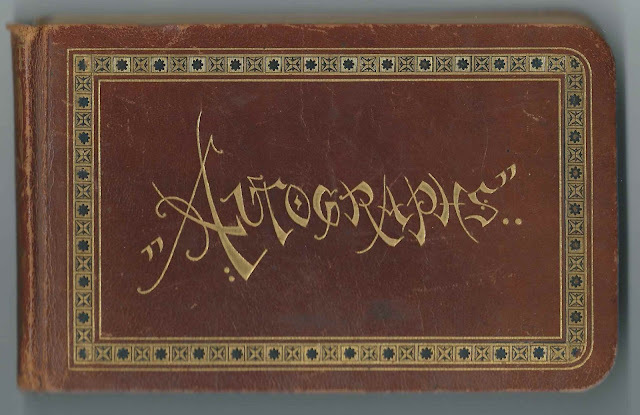 A. P. Phelps; not sure of initials, inscribed at Middleton, Massachusetts, on July 17, 1890, in what appears to be the shaky handwriting of an elderly person. Presumably Anna (Peabody) Phelps, wife of William Augustus Phelps, brother of Elizabeth H. (Phelps) Burnham, mother of album owner Elizabeth Frances Burnham. If this was Anna (Peabody) Phelps, she would have been about 80 years of age. Annie H. Phelps, "Your Affectionate Cousin"; inscribed on July 25, 1890 at Middleton, Massachusetts. Presumably daughter of Horace D. Phelps, a brother to Elizabeth H. Phelps, mother of album owner Elizabeth Frances Burnham. Martie, "Loving cousin", of East Weare, New Hampshire; inscribed at Dunbarton, New Hampshire, on September 29, 1886. 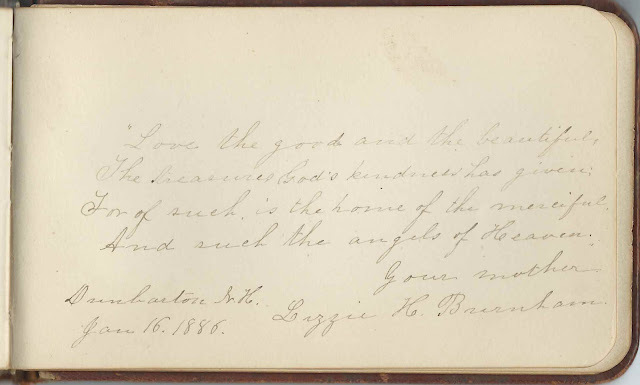 E. S. Benton; inscribed at Boston, Massachusetts, in March 1887. Several other inscriptions around this time were by women staying at the Y. W. C. A.; this might have been the case with E. S. Benton as well. Josie Blaisdell of Goffstown, New Hampshire; inscribed on January 28, 1885. Middle initial D. or L. or ? Jennie R. Brown, or Jennie K. Brown; inscribed at the Y. W. C. A.; presumably at the Boston Y. W. C. A. on March 28, 1887. Josephine M. Brown inscribed the right facing page. Josephine M. Brown of Boston, Massachusetts; inscribed on March 28, 1887; presumably at the Boston Y. W. C. A. Jennie R. Brown, or Jennie K. Brown, inscribed the left facing page. 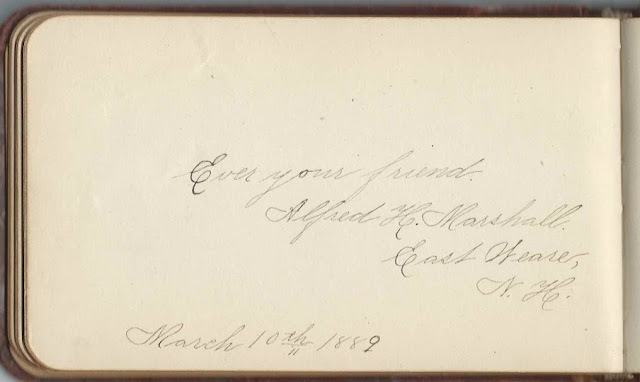 M. A. Burnham, "Your loving cousin"; inscribed at Dunbarton, New Hampshire, on March 15, 1885. Possibly Mary Abigail Burnham, daughter of William Bradford Burnham, a brother to Abraham Burnham, father of album owner Elizabeth Frances Burnham. Sadie Z. Downer of Charlestown, Massachusetts; inscribed at Dunbarton, New Hampshire, on September 23, 1886. She was Sarah Z. Downer. Jessie Durling of Boston, Massachusetts; inscribed on March 26, 1887; possibly at the Boston Y. W. C. A. as several other inscribers indicated on this same date. Elizabeth A. Garland, inscribed on March 26, 1877 at the Y. W. C. A., presumably Boston, Massachusetts, as similar inscriptions indicate. Mary T. Groom of Boston, Massachusetts; inscribed at the Y. W. C. A.; other inscriptions from the Y.W.C.A. were from March 1887, which may be the time frame of this inscription as well. Grace V. Holmes of Bridgewater, Massachusetts; inscribed on March 25, 1887; possibly at the Boston Y. W. C. A.
Mrs. Ruhamah J. Lord of Dunbarton, New Hampshire; inscribed on January 20, 1886. Presumably Ruhamah J. (Infalls) Lord, wife of Aaron Lord. Bessie S. Mowatt, inscribed at Boston, Massachusetts, on January 13, 1887. Several other inscriptions from that same time frame were from the Boston Y. W. C. A., and Bessie may have been living there as well.